I am wearing the Carmen dress from Kunglers for Fashion For Life. It’s clear it’s inspiration comes from the fiery Carmen of Bizet’s opera. Carmen is an opera filled with catchy tunes that you will find yourself humming for days. The music is beautiful and makes it easy to forget what a misogynistic story it is. It’s all too familiar. A man who cannot accept that the woman he loves does not love him decides that if he can’t have her, no one will, and murders her. What’s infuriating is that he’s the hero and she’s the villain. And it’s a comedy. Still, I love the music and never miss a chance to see it. Carmen is a free spirit with a lively wit and insouciant spirit who easily captures men’s hearts. She is someone who wants what she wants and doesn’t settle for less. Sure, she was a hussy, but only because that’s how our society stigmatizes women who won’t settle. I thought this might be the perfect dress to show you how to edit prims. I liked the dress as it came out of the box, but really wanted a shorter version. I love the bodice, the print and thought that it would be a perfect dance party dress if it were knee-length. So, since it is modiafiable, I decided to make it exactly what I wanted – a very Carmen thing to do. 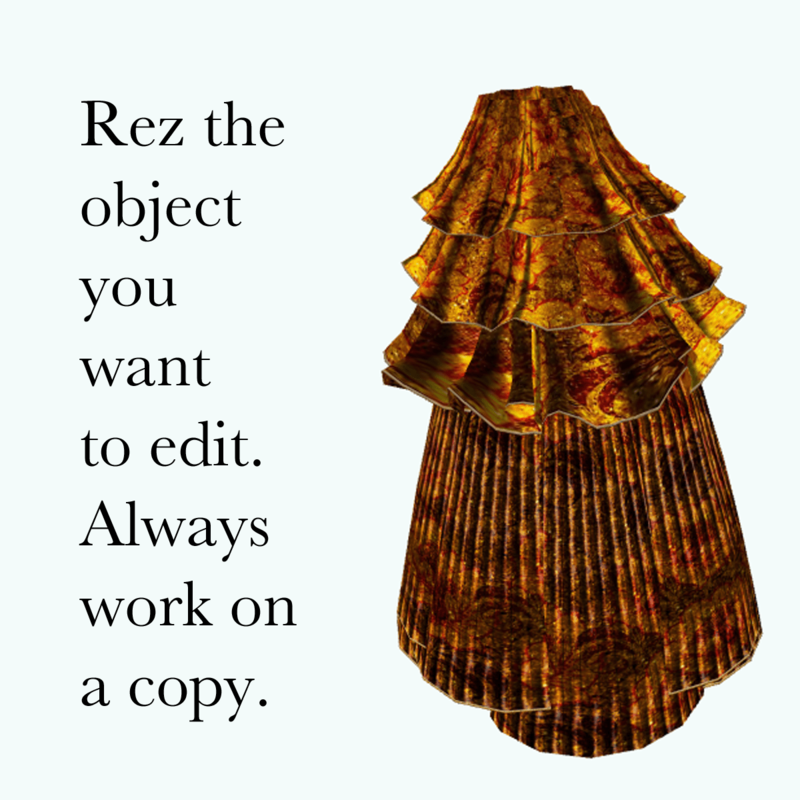 Always make a copy before rezzing any no copy objects. This skirt is copy/mod/no trans, so I simply rezzed it. 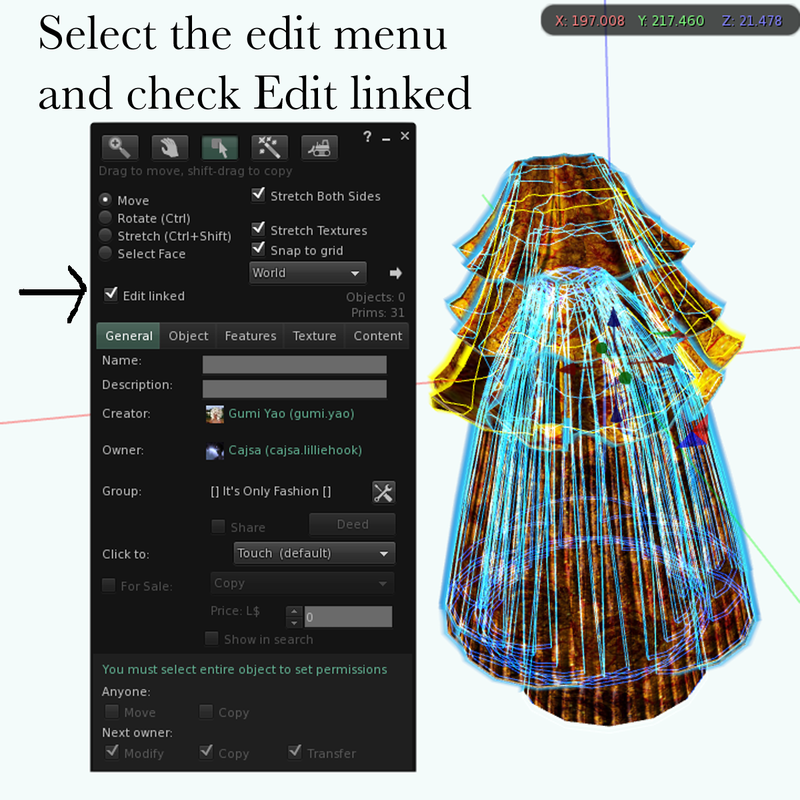 In the edit menu, check Edit linked so you can work with individual prims. Select the prims you wish to work with and then in the drop down menu, select unlink. I would not unlink the entire skirt, because you will have to link them all back again before taking the item into inventory as you cannot wear a composite. 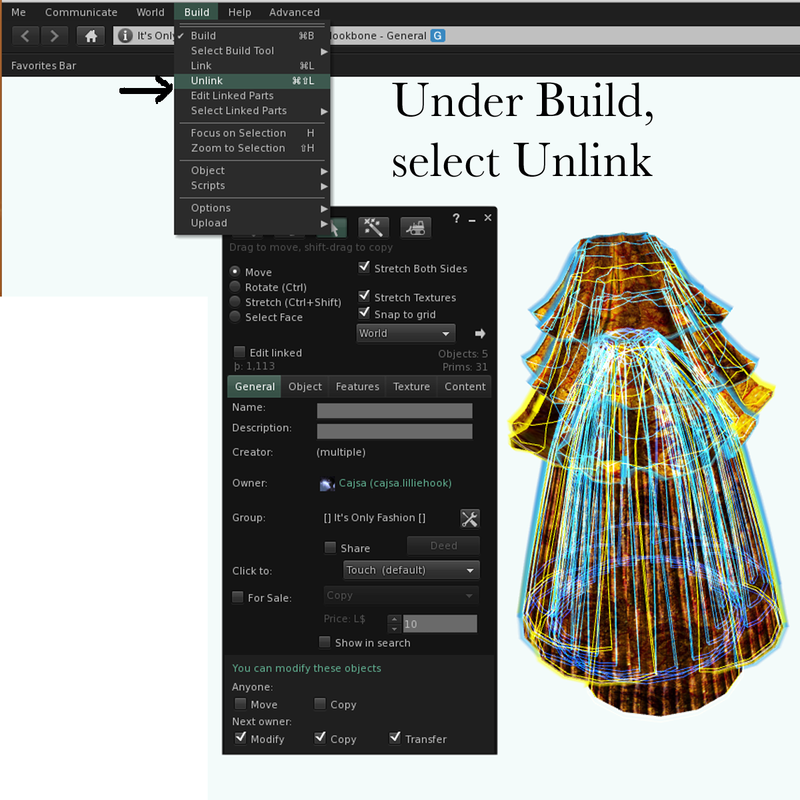 When linked, selected prims are outlined in blue. If they are unlinked, tehy are outlined in yellow. 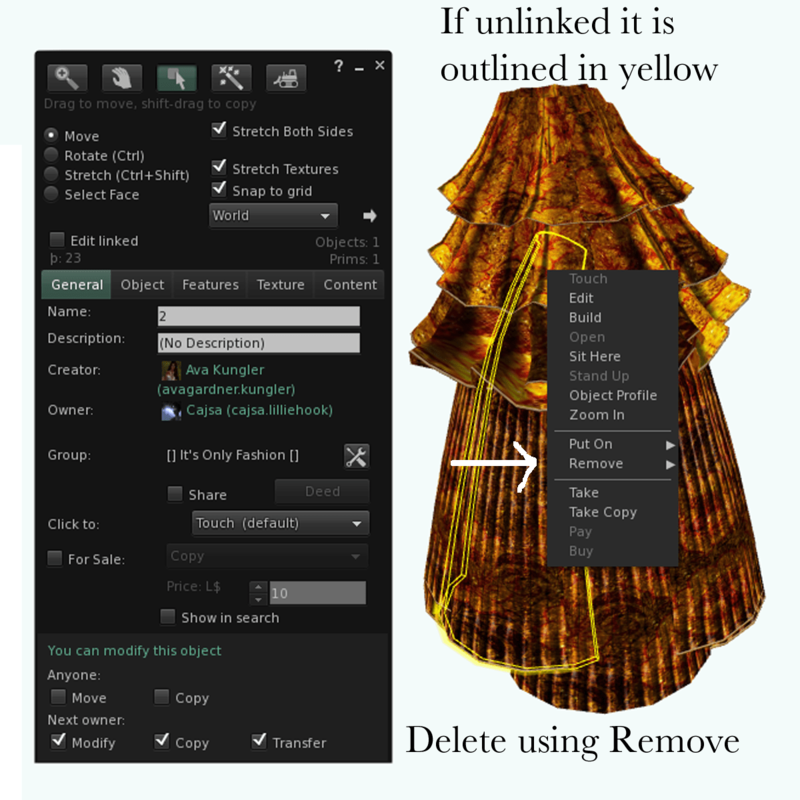 Simply select the unlinked prim and delete as you would any other item. So that is how Carmen gets her way. I shot this series at Green Emerald sim – an amazing build with all sorts of secret dales, vales, valleys and nooks and crevices that I will be exploring it again and again. Carmen would totally wear this hair from Detour. It’s called Torrid. Of course! She would also enthusiastically wear the lovely jewelry from EarthStones, jewelry as fiery as her personality and as bewitching. The queen of dramatic opera would need a dramatic look so I went with Redgrave’s Trinity skin which is high drama at its best. This is the skin for love, passion and murder. Now honestly, I wonder how many women feel sorry for the murdering stalker boyfriend Don Jose? This entry was posted in Expos, Fairs and Fundraisers, Great Places to Shoot, Second Life and tagged Detour, Earthstones, Fashion For Life, Kunglers, LeLutKa, Poetic Colors, Redgrave, Reel Expression, Stiletto Moody on March 21, 2011 by Cajsa Lilliehook. I think this dress is absolutely beautiful. The length at the knee make the ruffles flow not pouf. You use of the Carmen analogy was very interesting as well. Casja, thanks for the great coverage, the excellent write ups, the flat out amazing freakin photos and the great tutorial here.. wow! Casja is BACK! Thanks! Maybe not 100% back, but well on my way!